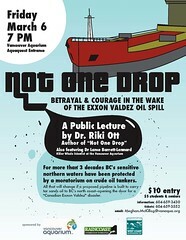 In the face of renewed proposals for crude oil tankers on BC’s coast, understanding the lessons of the Exxon Valdez oil spill has never been more critical to British Columbians.Join us at the Vancouver Aquarium (Aquaquest Entrance) for a public lecture by author, scientist, and story-teller Riki Ott, PhD. Her latest book, ‘Not One Drop’, chronicles the Exxon Valdez disaster in Alaska and its lingering effects on the environment and on coastal communities. Dr. Ott weaves her evolution from academic to citizen-activist after the continents’ largest oil spill. She offers thought-provoking perspectives on the climate crisis, the economic crisis, and how we can nurture more participatory democracy by building sustainable communities and separating corporations and governments. Come and learn why you should care and how you can help make a difference. The lecture will begin with an introduction by Vancouver Aquarium research scientist Dr Lance Barrett-Lennard, who will discuss recent research findings on the long-term impact of the Exxon Valdez Oil Spill on killer whale populations. Presented by the Vancouver Aquarium, the Raincoast Conservation Foundation, and the West Coast Environmental Law Association.